The politics of populism or misplaced notions of polity? An interview with Sunday Guardian‘s Atul Dev on the Aam Aadmi Party’s government’s actions in Delhi. The AAP’s dharna against the Delhi Police officers was termed unconstitutional by many. What is your view regarding this? (Nitin Pai). Anyone going on a dharna is adopting non-constitutional methods. As Ambedkar says, there is no place for non-constitutional methods when constitutional methods are available. For a chief minister to go on a dharna is doubly disturbing because an official sworn to uphold the constitution is resorting to non-constitutional methods. It sets a bad example — if everyone who feels dissatisfied with the “system” decides to adopt non-constitutional methods, what is the yardstick by which society decides what to do? We will end up with the law of the jungle, and the strong will prevail over the weak. Q. How do you react to Arvind Kejriwal being labelled an anarchist, and if you agree, how will it affect the political atmosphere of Delhi? A. Mr Kejriwal might or might not be an anarchist, but the methods he adopted legitimise people breaking rules and due processes, based on their own assessment of right and wrong. This is a formula for anarchy, as in a diverse country like India, almost everyone has a grievance, almost everyone believes that his cause is right and almost everyone believes that they’ve waited too long for justice. Q. Many wrote off Arvind Kejriwal as the Lokpal movement came to close. What do you think were the major factors responsible for him coming to power? A. There is clearly a wide-open governance gap because the UPA government almost entirely lost the plot, and was unable to even persuade people that there is a coherent government in charge. There are also underlying factors: urbanisation, sizeable middle class, instruments like RTI and social media created the conditions for urban India to begin to find its political footing. These factors, plus some clever old-style populist political promises helped Mr Kejriwal win. Q. AAP has made it clear that it would be contensting Lok Sabha elections, but the party’s stance on a lot of big issues like nuclear power remains vague and unaddressed. Are issues like foreign policy not people’s concern? A. AAP does not seem to have a coherent policy agenda. As it moves from being an activist movement to a political party, it will realise the need to be coherent and consistent. It is no longer tenable to say foreign policy does not concern ordinary people — how many visas the US issues, what happens to the surplus militants fighting in Afghanistan, what happens to Sri Lankan Tamils, Bangladeshi Hindus and Tibetans across our borders affects us materially and emotionally. Indeed for a country like India that is highly dependent on energy imports, foreign policy matters for things like keeping the lights on and how much we pay for the fuel to run our vehicles. It is another matter that AAP’s leadership is not overly concerned about these matters. Q. How important is it for them to chalk out an ideology for the party? A. A party ideology itself is not important — the issue is whether their policy agenda is based on sound economic reasoning or folksy rhetoric. Right now, I can’t see any serious economic reasoning. Q. With some of their well-intentioned policies, AAP seems to be making the same mistakes that UPA1 did — channeling tax payers money in freebies — would you term this symptomatic of populism? A. It is very easy to play to the gallery. Sustaining efficient public services — which is what AAP’s urban constituents want — requires clear-headed economic reasoning. AAP’s actions are currently more fulfilling of wishlists than any attempt to put in place sustainable governance frameworks. The problem is that making scarce resources “free” increases their overconsumption and is effectively a reallocation of national resources to a select minority. “Free” water disproportionately favours the people who have water connections, “Free” electricity favours those who have electricity connections. So not only are we depleting scarce natural resources, we are transferring national wealth to those who are not the neediest in society. It makes public services unsustainable, and in the end, everyone suffers the consequences. The rich can cope, the middle class will suffer, but the poor will suffer the most. Seen from this perspective, these measures are not “populist”, they are “anti-people”. Q. During both the Lokpal movement and the short time that AAP has spent in office, statements that are not in line with the party’s vague ideology kept creeping out. Do you think the party is a bit too autonomous for its own good? A. It’s a good thing for party members and MLAs to differ from each other. Our system does not demand that everyone toe the party line. Ministers, though, have to reflect the cabinet’s position, which is the official government position. Q. Do you think that AAP has been victimised by over analysis and early assessment by the media? A. There is a certain fairness to the disproportionate scrutiny of AAP and the Kejriwal government in New Delhi. The media are only judging them on the basis of their own claims to be extraordinary and different from the current lot. AAP enjoys favourable media coverage when they make grand claims, so the party shouldn’t complain when people hold them to those standards. So too for early assessment: if AAP had promised quick results then it is not unfair to judge them by their own standards. In my view, AAP’s claims and promises are unrealistic both in timeframes and in their ability to achieve the governance outcomes that we all desire. We are in a phase of democratic experiment and it is important that the public learns that good intentions and honest people are insufficient to deliver good governance. Good ideas and good reasoning are necessary too. That way, in the next round, people can demand both righteous people and sound policy ideas. Q. What do you think is the biggest challenge that lies ahead for the party? A. AAP’s biggest challenge is to move from being a rabble-rousing activist group to a proper political party that is interested in strengthening the Indian republic. Q. How important is it for AAP to alter the atmosphere of political cynicism that it bred during Lokpal movement, and how can they do it? Thought I don’t agree with Kejriwal, I disagree that his dharna is unconstitutional. The Constitution allows for peaceful protests. It doesn’t restrict that freedom to non politicians. It doesn’t matter who goes on a protest, or for what cause. As long as it’s peaceful and doesn’t turn violent, it is by default legal and constitutional. Completely agree with Nitin. Nicely put. 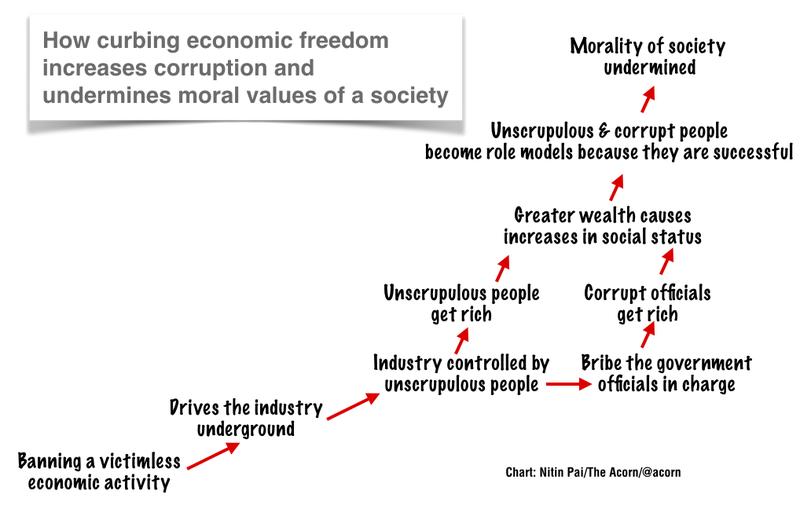 Previous Previous post: What causes corruption and erosion of moral values?